The instruments are gone and just their cases remain. However, they’ve been stuffed with circuitry causing them to vibrate along with other objects such as a spoon and teacup. Once synchronised this lack of instruments can still create a harmonic symphony that evolves from gentle thrum to complex composition. After a lengthy wait Hayward Gallery is open again and it returns with a massive show of Andreas Gursky’s photographs. Fields of solar panels that seem to roll off into the horizon and shelves at an Amazon warehouse that appear to go on forever. Gursky loves to show us the scale of a world we know exists but seldom get to see. Whether it’s Formula 1 cars frozen in time at a pit stop or a rather empty stretch of the Rhine there is stunning detail in every work. It’s a breathtaking return for this gallery. Until 22 April. Dale Chihuly the master glass sculptor returns with more of his beautiful graceful works. Best known for his giant work hanging in the entrance hall at V&A, there’s more of the same in this stunning show. Tendrils emerge from the walls, the floor and downstairs they seem to be floating in water in the atmospheric lighting. Until 22 April. Can we ever find utopia? Benjamin Deakin seems to think not. His paintings look post-apocalpytic yet the warm colours suggest it isn’t all that bad. It appears to be a living room but there’s a giant cube in it. These detailed paintings are filled with contradictions and it plays with our sense of what’s real and challenges us to recognise that perfection doesn’t exist so we need to live with what we have. This space in Bermondsey is also a new gallery find for me and that’s another plus. Until 21 April. A double header of Indian themed exhibitions has landed at Science Museum. First up is a 5,000 year journey through Indian contributions to science and technology, from coming up with the concept of zero to the invention of USB ports. Next door is a photography exhibition that looks at historic portraits of nobility through to the modern India of workers eating at roadside stalls. Two great shows to help celebrate 70 years of Indian independence. Until 22 April. Time to get dotty with a trifecta of artists who all used dots in their work. There are some excellent works in here by Roy Lichtenstein and Sigmar Polke, plus those by Gerald Laing who I was less familiar with. Lichtenstein’s Frightened Girl, with tears welling in her eyes, is my favourite work in the show capturing raw emotion perfectly. Until 21 April. This exhibition charts the story of how jazz made its way across the Atlantic from the States. There are energetic artworks, early footage of a wing walking jazz band and stories about how race barriers were overcome all to a great soundtrack played throughout the exhibition. Everything from tea sets to London Underground posters drew inspiration from this era, and the exhibition is housed within an architecturally gorgeous building. Until 22 April. 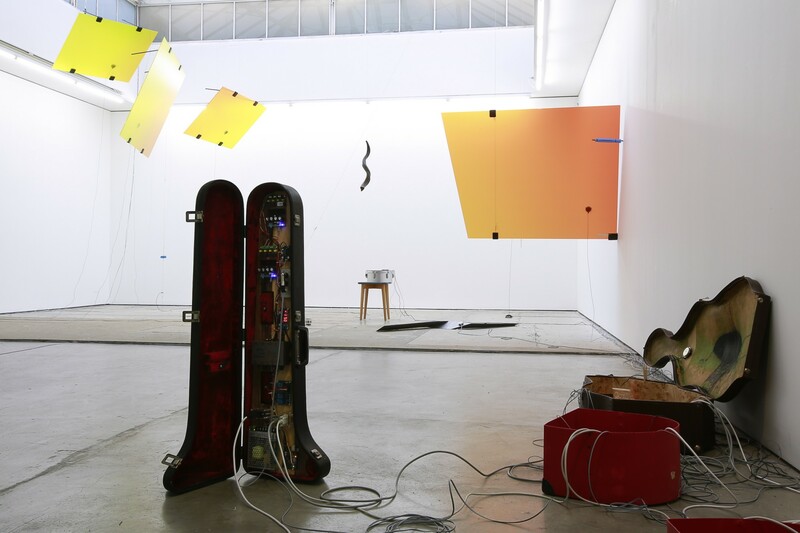 Tamar Harpaz: Crazy Delay is on view at Edel Assanti through 21 April.